VIII: Bleriot had avoided serious injury in the crash of Type VII due to the presence of the new cabane, and he used it regularly on his monoplanes for years after. 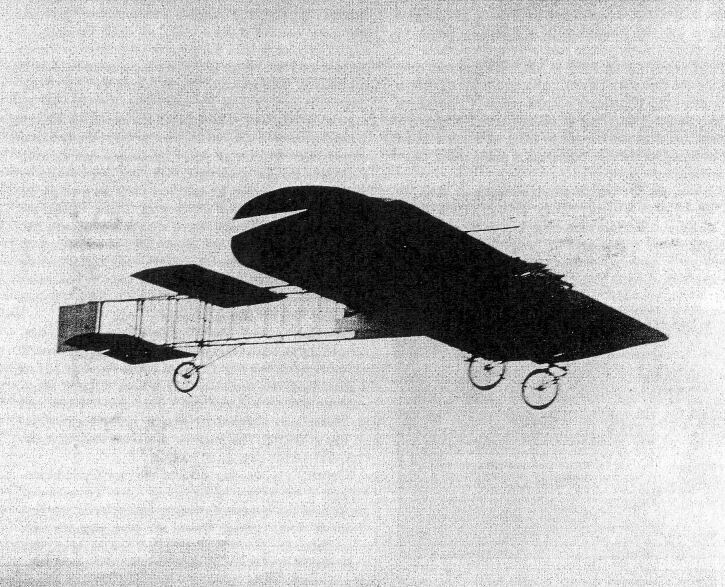 Built and tested between February and May 1908, Type VIII was a big high rectangular-wing monoplane, all covered with varnished paper, powered by the 50 hp Antoinette; the distinctive big flat radiator was set under the nose between the landing gear legs. The VIIIbis was tested in June with a new broad wing of increased incidence, camber, and curved tips; the rear end of the fuselage was uncovered. It made flights of 400-700 m at Issy. Refitted again with drooping ailerons and the first of Bleriot's famous cloche controls, it made some good flights and impressive turns, and then crashed badly on 23 July. Reconstructed again, this time as the Vlllter, its fuselage was shorter and the ailerons were replaced by the old oyster-shell tip surfaces; there were 2 staggered horizontal tail surfaces, one above and one below the aft fuselage, which was still uncovered. It flew from August till 4 November, when it was destroyed in a crash, Bleriot himself undamaged. The Type VIII inflight. Note tip elevators, single tailplane. Bleriot at last began to taste real success with his No VIII monoplane after he had fitted pivoting wingtip ailerons. This is the machine in its short-fuselage VIIIter form. The Type VIIIter, with staggered tailplanes and a shorter fuselage.